WATFORD, England — Arsenal benefited from a bizarre goal from a goalkeeping error and Watford striker Troy Deeney's red card to claim a 1-0 win that lifted the team back into the Premier League's top four on Monday. 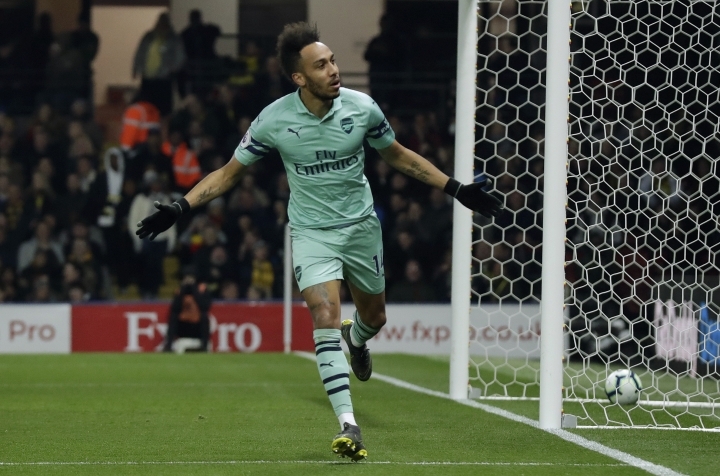 The match was ultimately decided in the space of a few seconds in the first half, with Arsenal going ahead in the 10th minute when Watford goalkeeper Ben Foster dallied on a back pass, then slammed his clearance into the outstretched left boot of Pierre-Emerick Aubameyang. The ball rebounded into the net from six yards (meters). 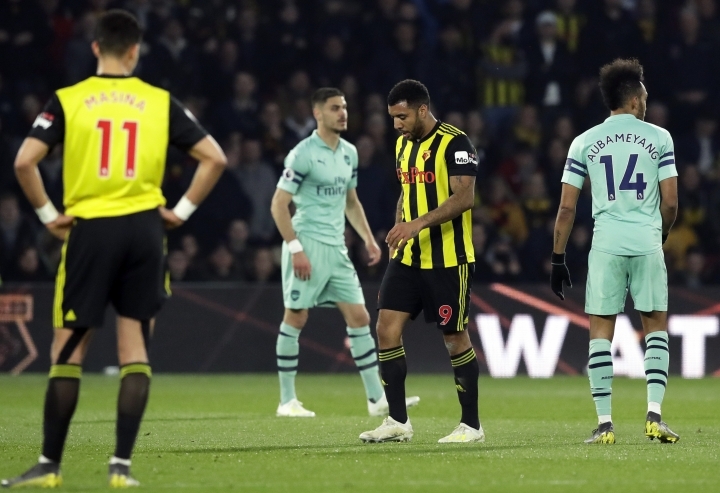 Within a minute, Watford was reduced to 10 men when Deeney was sent off for elbowing Lucas Torreira in the face after the Arsenal midfielder had passed the ball to a teammate. Arsenal was hardly convincing at Vicarage Road despite playing with an extra man for most of the game, but came away with a second away win since November to climb above Chelsea into fourth place on goal difference. It was Arsenal's first clean sheet in an away league match this season. "We were competitive, but in the circumstances we can control the match better," Arsenal manager Unai Emery said. "We didn't make it easy to score the second goal. We did not control the ball in the attacking third." Aubameyang, playing his first full season in the league, moved onto 18 goals and is only one behind top scorers Sergio Aguero of Manchester City and Mohamed Salah of Liverpool in the race for the Golden Boot. Liverpool's Sadio Mane also has 18 goals. The Gabon striker is unlikely to score a more bizarre goal this season but did well to close down Foster as the goalkeeper received a back pass from right back Daryl Janmaat. As Foster attempted to clear, Aubameyang got across the goalkeeper and saw the ball career off him into the back of the net. "I've said sorry to the lads," Foster said. "I have tried to drag it on to my left foot and pass it out but before I knew it he was on me. He is too quick. "In hindsight you have to get rid of the ball as quick as you can, even if it goes into row Z." Deeney, who prides himself on being an intimidating striker, previously questioned Arsenal's stomach for a physical battle, saying after a home win in this fixture last season that its players can be bullied and lack "cojones." In the opening minutes, his physicality was on show but he took things too far moments after the restart following Aubameyang's goal. Torreira played a pass across the field before he was clattered by the right forearm of Deeney, who needlessly and aggressively leant into the diminutive Arsenal midfielder. The referee took his time before showing a straight red card to Deeney, who complained bitterly. "I respect the referee's decision, but I don't agree," Watford manager Javi Gracia said. "In my opinion, it is a yellow card but never a red." Watford barely tested Arsenal goalkeeper Bernd Leno but did apply pressure in the final half-hour and came close to equalizing when Adam Masina fired a long-range effort against the woodwork in the 62nd minute.